The British are coming! This weekend! To Haddonfield! 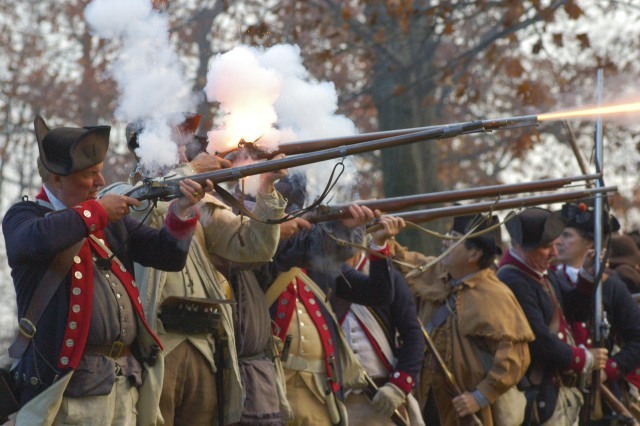 Parts of Haddonfield will be closed to parking and traffic for a period Saturday as part of a re-enactment of the 235th anniversary of the British occupation of Haddonfield during the Revolutionary War. The battle itself will take place from about 1 to 1:30 p.m. when members of the 2nd Pennsylvania Regiment, encamped at the headquarters of the Historical Society of Haddonfield at 343 Kings Highway, will march down Kings Highway and encounter the 1st New Jersey Volunteers — who will be acting as a Loyalist unit of the British Army based at the historic Indian King Tavern, 233 Kings Highway. In addition to the battle, attendees will have a chance to meet and speak with the re-enactors at their camps from 10 a.m. to 4 p.m.
Kings Highway will be closed to parking from Haddon Avenue to Grove Street from 7 a.m. until approximately 2 p.m. Saturday. This same area will be closed to traffic from about 12:50 p.m. until 1:40 p.m., according to NJ.com. This entry was posted on May 31, 2013 by Barrington Bulletin in Events, Region and tagged haddonfield, revolutionary war, things to do.